ripley's believe it or not! 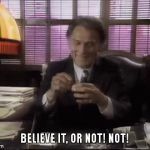 Jack Palance says, NOT! BELIEVE IT, OR NOT! NOT!